Rock history is full of legendary reunions, but sadly The Beatles can never be counted among them. 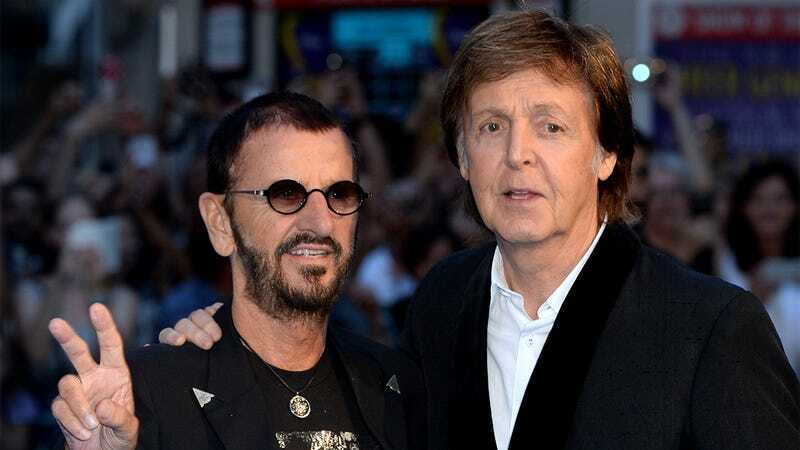 Yet that hasn’t stopped remaining members Paul McCartney and Ringo Starr from trying: Here are four times that Paul and Ringo gleefully announced a reunion of The Beatles before remembering that John Lennon and George Harrison are dead. 1. The time Paul and Ringo announced a reunion on the Today show and started sobbing after Katie Couric mentioned that John and George had passed away: In the spring of 2007, Paul and Ringo went on the Today show to announce a Beatles reunion tour. The two surviving members of the Fab Four seemed ecstatic after announcing the news, until Katie Couric interjected, saying, “I think it’s so brave of you two to continue making music as The Beatles, despite the deaths of John and George.” Paul and Ringo then slowly turned toward each other before erupting into tears. They would continue sobbing throughout the rest of their appearance, including later in the show during a planned cooking segment with chef Jamie Oliver. 2. The time Paul and Ringo announced a Beatles reunion at George Harrison’s funeral: Halfway through George Harrison’s funeral, Paul and Ringo walked up to the podium holding hands and smiling. “We’re getting the band back together!” Paul declared joyfully, and he and Ringo began hugging each other and laughing before turning around and seeing George Harrison’s body lying in his casket. Paul and Ringo abruptly burst into tears in front of everyone. An usher at the back of the church shouted, “John Lennon’s dead, too!” which only made Paul and Ringo cry even harder. 3. The time Paul called Ringo to get a reunion together and remembered three seconds into the call that John and George had died: In the summer of 2012, Paul McCartney called up his old bandmate Ringo Starr. When Starr answered, Paul said, “Ringo! It’s Paul! Let’s get the band back together!” Before Ringo could answer, Paul immediately said, “Never mind! I just remembered that John and George are dead!” and then hung up the phone. 4. The time Paul and Ringo remembered that John and George were dead in the middle of a Beatles reunion at the Super Bowl XLVIII halftime show: This infamous Super Bowl set began with Paul and Ringo taking the stage and launching into a drum-and-bass-only rendition of “She Loves You” before Paul McCartney began to frantically wave his arms to stop the music. “I’ve just remembered something terrible: John Lennon and George Harrison died 34 and 12 years ago, respectively,” Paul said amid stifled tears. This then prompted Ringo to become hysterical himself and run over to McCartney and embrace him. As the pre-timed fireworks went off behind them, and with millions watching all over the world, Paul and Ringo collapsed to the ground, weeping into each other’s arms over their fallen bandmates.